Band leader, songwriter, singer and producer Johnny Otis has passed away. was an American Master, a truly great man who helped bring a fantastic number of brilliant rhythm and blues artists to greater fame and acclaim. I had the pleasure to meet and interview him back in the Seventies, when he had just become a minister and opened up his home in Los Angeles as his church. He was gracious, sane, civilized, believing that the spirit of God blesses all of us and our best talents; he though it was his calling to help his fellow humans become their better selves. The service that my associate Barry Alfonso and I attended in his South Los Angeles home back in the Seventies was a long one, with a choir of splendidly tuned vocalists revving up the already considerable spiritual energy in the room while Reverend Otis, citing Gospel, citing the Jesus of his understanding, gently but firmly exhorted his congregation to be more Christ like, that is, to be kind, helpful, loving of others. In attendance was famed jazz organist Jimmy Smith and singer/actress Della Reese, both of whom performed musical numbers at the Reverend's request. Later in the service, Otis asked us to turn to the person on our left and the person on our right and say "God loves you and I love you to." On my right was Barry, whose hand I shook. We exchanged nods, trying, I suppose, to sustain a veneer of journalistic cool, but on my left was Miss Reese, who took my hand and said with a wide smile that God loved me and that she loved me to. On instinct I return the greeting, feeling that I had just shaken hands with someone who was genuinely connected to the message of love that Otis carried and preached. In some circles, in certain cliques, in specific venues, this view of God and his purpose for us on this planet seems naive, but it occurred to me decades later that Johnny Otis had tapped into a theological proposition more profound than one would at first think. It was so subtle that the majority of the religious celebrities miss it, that life on earth matters a great deal most of all; we are not here merely to perform perfunctory good deeds as if existence were merely a test to get into a celestial graduate school. Rather, we were here to love , nurture and help one another, to create joy and happiness through creative acts and the practice of a kind of selflessness that brings us a new freedom. During our talk with Johnny Otis in his office before the service, the musician spoke at length about the gift of music and the connection it gives him to the lives of others. about how he could feel the real pain, joy and struggles in the voice of Esther Phillips, the searing saxophone of Eddie "Cleanhead" Vinson. It was art as a spiritual calling, a manifest destiny to let people know that a surrender to the God and Jesus that Johnny Otis and his brethren spoke of could not only make life on in this existence bearable, but better, tangible better. That is the power of love Johnny Otis spoke of and that is the glory of the music Johnny Otis made. Yes, I also remember that day in Inglewood, when we sat down with the Rev. Otis in his office and then proceeded to take part in a service unlike any I’ve ever attended before or since. It was the summer of 1980 (I’m pretty sure of that, Ted) and we went up there with the intention of writing a magazine piece about Johnny that, sadly, never got done. I wish I’d kept the interview tapes/notes of our conversation, because now the Reverend has passed into history and we had the honor of talking with a figure truly of the ages. 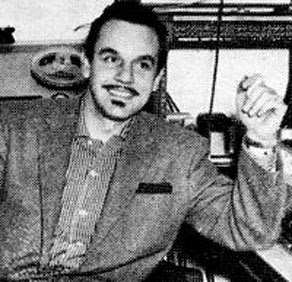 Johnny Otis helped to create Rhythm and Blues and rock ‘n’ roll. But his significance goes far beyond that. Because of the prejudice against “race music” in the ‘40s and ‘50s, those who worked in this idiom were not considered to be accomplishing anything important by the pundits of the time (except possible corrupting the decent youth of America). But Otis – a Greek-American who thoroughly identified with African-American culture – broke down barriers and promoted brotherhood by his personal example. He crossed the color line and put himself at physical risk when he toured with his musical caravans south of the Mason-Dixon line. He defied racism with stubborn courage and an unshakable spirit that translated easily to a preacher’s calling some years later. Otis was in effect a preacher long before he became a man of a cloth – he preached love, joy and humanity with his music and by his example. He did it with a smile, with happy, crazy records like “Willie and the Hand Jive,” but also with a refusal to bow down to the profound, overt racism of the time. You can hear all sorts of echoes of Otis’ early jump blues and R&B hits in contemporary music – for instance, Tom Waits’ gutbucket outpourings owe a great deal to the rumble and squawk of records like Big Mama Thornton’s original version of “Hound Dog,” produced by Johnny. But I think of the Reverend Johnny Otis as much more than a guy who led a band and cut some great records. He fought an entrenched evil and helped to make America more just and humane. And that’s a lot more than just hand-jive. An amazingly successful rock band with some indisputably talented musicians, the Eagles are a band I never cared about. Even in their best songs they seemed smug in the depths of despair, depression and bad-luck stories their songs evoked. Tuneful, well crafted, laden with nicely arranged guitar textures and indicidental instrumentation,the sweetly harmonized lyrics were a first rate evocation of bankrupt imaginations trying their best to out -bottom the rest of rock and roll's iconic desolation row residents. Theirs was a music akin to an old car with a great, shiny new paint job; attractive surface gleem, noisy and tired under the hood. For all their gold records and fanatical fan base,they have proven to be even more tiresome than U2.